If you think it’s been hot and dry where you live, and the mass fish-deaths on the Darling River upset you, spare a thought for those trying to grow wine grapes in the Riverland. One of the region’s most thoughtful spokespeople, Ashley Ratcliff of Ricca Terra Farms, is a leading proponent of planting grape varieties that suit the hot, dry conditions – ie. Mediterranean and Iberian rather than classic French varieties. I recently tasted some of his latest Ricca Terra wines, red nero d’avola and tinta barroca, and white arinto. Coincidentally, he issued a statement concerning the way forward for the Riverland. He also mentioned that the above varieties all performed well during the recent heat. It’s long, but because it’s so important, I’m reproducing his entire statement here. “Charles Darwin’s famous quote, ‘It is not the strongest species that survive, nor the most intelligent, but the most responsive to change’ rings true in today’s world of grape growing! “Strength and intelligence are two traits that, while important, don’t rate as highly as vision, dreams and the willingness to change when Ricca Terra thinks about the management of its vineyards. “The facts suggest that many grape growing regions of Australia face a future with less water for irrigation and more extreme weather events. It is hard to dismiss the eventuation of such a horizon after the last few months of record-breaking temperatures and a drying Murray-Darling Basin. “My dream, or should I say nightmare, nearly fifteen years ago, was that the French grape varieties we inherited in the vineyards we purchased would struggle to be viable in conditions we have recently experienced. That nightmare prompted us to consider grape varieties that would be better suited to warmer and drier climatic conditions rather than relying on good fortune for the success of our business. “To discover and understand what would be the best grape varieties to plant, we travelled around Australia and the world, looking at vineyards and talking to other grape growers and winemakers. We then came home and started the ‘change process’, which was replanting many of our French grape varieties with varieties we believed would adapt to a changing climate. “The intense heat wave we have experienced since Christmas 2018 has carved a clear line in the sand as to what the potential future of the Australian Wine Industry may look like, especially for regions dependent on irrigation water from the Murray-Darling Basin. It is no surprise that vineyards in the inland wine growing regions of Australia have shown little impact from the recent searing heat (signs being leaf and fruit burn). How can this be when there have been other regions that have suffered? The secret is more water application leading up to and during the extreme heat. Most inland grape growers have exceptional knowledge on how to manage heat-waves. Unfortunately, if grape growers fail to apply more water during a heat wave, the results are scorched leaves, shrivelled fruit, crop loss and the potential production of inferior wine. “During the recent heat-wave, we have asked many questions of ourselves as to what we should be doing. The leading question has been, ‘is applying more water than normal to a grape variety that has a low value a smart thing to do?’ We know many grape growers that have applied massive amounts of water to get through what has been hell on earth. Our decision has been not to waste water on grape varieties that we feel are economically unviable. As a result, we have seen signs of heat stress in some of our French varieties. While this has been personally distressing, the outcomes have somewhat justified our strategy to start changing the grape varieties we grow at Ricca Terra. “So how viable is it to grow a grape variety like chardonnay in the warm inland irrigated region when grape prices are low (2019 vintage price for chardonnay is AUD $350/tonne) and input prices are on the rise? It is not uncommon for grape growers to be applying up to 33% more irrigation water than normal to mitigate the impacts of a heat-wave. With temporary irrigation water values at AUD $525/megalitre (as of 11th February 2019), the use of extra water comes at an expensive cost (especially if a grower has to lease in all his/her water). Adding the other costs linked to growing grapes (pruning, spraying, fertilizer, harvesting and so on), the break-even point for a grape grower producing chardonnay in the inland regions can be as high as 27 tonnes per hectare. This means a grower needs to grow 27 tonnes per hectare to recover all his/her costs. According to the Wine Grape Council of SA Vintage Survey, 26.7 tonnes per hectare is the average yield for chardonnay grown in the inland regions. This means most grape growers in the inland regions are growing chardonnay at a loss this year if they are not growing massive crops! “Has Ricca Terra’s ‘change’ strategy been a success? The answer is yes! Take for example nero d’avola. Nero is a very vigorous grape variety. We have grafted it onto ruggeri rootstock (also very vigorous). The combination of a vigorous rootstock and grape variety means one thing, and that is less water is needed to maintain a healthy vine. On average, we have found that the nero d’avola/ruggeri rootstock combination uses 50-60% less water than the French grape varieties planted at our farm. “So is nero d’avola viable to grow in the Riverland? Using the same financial considerations as applied to chardonnay, the break-even point for nero d’avola grown on our farm is 5 tonnes per hectare. Why is this? The key reasons for the difference are varieties such as nero d’avola are valued by winemakers (price per tonne >AUD $1,350) and the combination of these varieties planted on drought tolerant rootstocks uses less water (meaning less cost). With the production of nero d’avola at Ricca Terra being many times above this break-even point, growing nero d’avola is profitable. Added to this, it’s a variety that is being made into wine that retails for more than AUD $20 per bottle, it has less impact on the environment and is a variety in high demand. It is the future! “The above scenario is similar for all the new and interesting grape varieties Ricca Terra dreamed of planting fifteen years ago. Today the grape varieties we grow include aglianico, albariño, ansonica, arinto, barbera, durif, fiano, greco, grenache blanc, lagrein, lambrusco maestri, montepulciano, negroamaro, nero d’avola, nero di troya, parraleta, slankamenka bela, tempranillo, tinta amarela, tinta barroca, tinta cão, touriga nacional and vermentino. 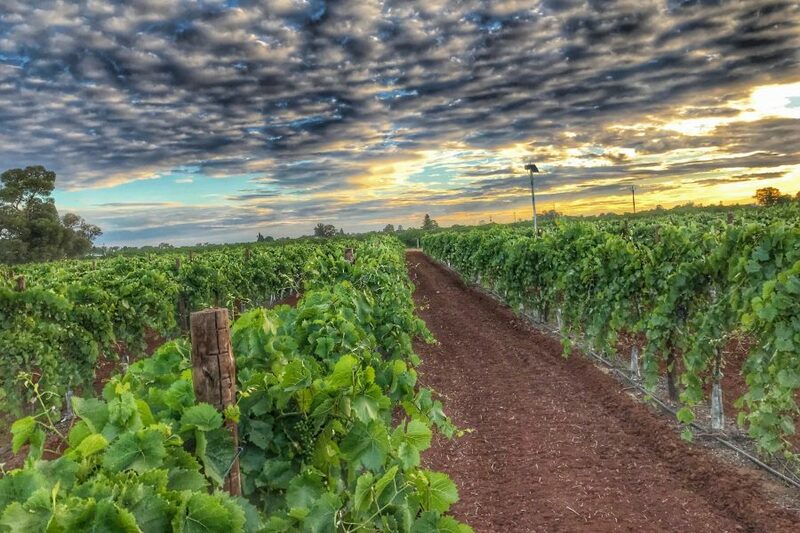 “If grape varieties such as nero d’avola appear to be so beneficial for profit, wine quality and the environment, it would be assumed there would be a groundswell of these grape varieties being planted, especially in the inland irrigated regions of Australia. Unfortunately, for reasons unknown, this is not happening. Instead, grape growers continue to farm and plant their traditional French grape varieties. “You may be asking, why I have sent you this information? There is an element of frustration towards the lack of willingness from some players in the wine community to acknowledge that many of the grape varieties I have listed above are the essential missing pieces of the puzzle that will help contribute to a more interesting and profitable wine sector. More importantly, these grape varieties (plus the use of drought-tolerant rootstocks) are one of many ways to help preserve the Murray-Darling Basin. “Another reason for me sending you this information is to say thank you. You have, over time, supported Ricca Terra. You are one of many. Our dreams mean nothing if no one knows about them and hence we thank all those wine writers who have told our story. Our grapes are just a commodity if our winemaking customers did not appreciate our efforts and reward us accordingly. The wine we make would not exist if our customers did not believe that they tasted great and were good value for money. *Ashley Ratcliff is the winner of several awards including the 2015 Gourmet Traveller Wine magazine viticulturist of the year award.